Everybody loves Heidi's boyfriend - Gingerbread Ed. He's deliciously perfect - a gorgeous, guitar-playing, motorbike-riding poet. There's one tiny problem -he doesn't exist. Heidi invented him in an emergency. Dating an imaginary biscuit can be surprisingly dangerous. First of all: The Cover. I really like the real gingerbread people on the cover, it's very cute. I'm not too sure about the font of the title, though, I find it a bit hard to read; but the colours are cool and they definitely stand out - that's always a good thing! I like the little love heart sweet on the cover, too. It's keeping with the sweets theme but it's also a LOVE heart, so it ties in with the story as well. I love the idea of The Little Leaf coffee shop where Heidi works. Her boss's name is Betsy and she has a teenage son called Teddy although his real name is Rupert. I love this mini storyline, it works so well weaved in with the main story. And you'll NEVER guess what happens at the end!! ....Obviously I'm not going to tell you what happened, although it's SO tempting because it's SO good! The characters are funny and realistic, especially Heidi. Ludo, Heidi's best friend, does get a bit annoying after a while...I don't think she's as realistic as some of the other characters, and her random shouts of OMG!!! while funny at first, do get a little annoying towards the end. are really cool and definitely something I have never seen in a book before - very unique. Overall I'd say this novel is amazing and a must-read for anyone who loves a bit of humour. I give it a rating of 5/5 - Susie, you are now one of my new favourite authors!! I loved this book- though I haven't read the UK version. 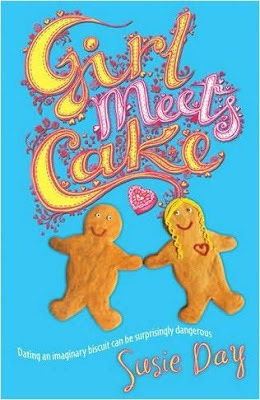 I like the UK name more [Girl Meets Cake], but before reading it I liked My Invisible Boyfriend. Ed is the best character, and I agree about Ludo, her OMG!! 's are slightly annoying after a while- but she's so sweet and caring!